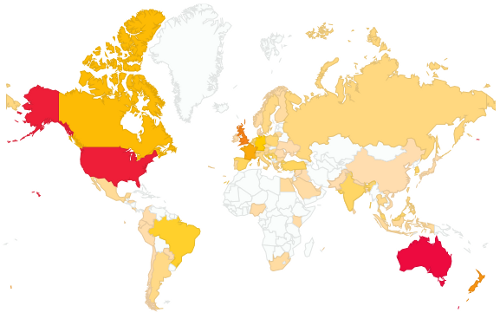 After seven months of blogging here, it’s time to say a big “thank you” to my readers… who seem to come from almost everywhere! Next post in a few days. The Google Street View team have made available a spectacular view of the Large Hadron Collider underground at CERN. See here for more details, links, and some fantastic screenshots. A perfect spot to explore (by remote control) on a rainy day! Museum Victoria has a nice travelling exhibition and website on the Art of Science. The image above (from Audubon’s Birds of America, courtesy Toronto Public Library) is one of the many wonderful illustrations, historic and modern, in the exhibition. Well worth a look – electronically, or in person in Mildura (till 3 Nov), in Sale (16 Nov to 12 Jan 2014), or in Sydney (23 Jan 2014 to 30 Mar 2014). There is also associated book, reviewed very positively here. The alembic, illustrated above, is an ancient item of laboratory equipment. As with algebra, Alnitak, and alizarin, the Arabic definite article in the name indicates a borrowing from the Islamic world. The device seems to date from then-Christian Alexandria (Egypt) in the first few centuries AD. The Greek word ἄμβιξ (ambix) led to the Arabic الأنبيق (al-anbīq) and hence via Latin to the English word. The Google ngram above shows the decline in popularity of the English word since 1700. We now have more sophisticated distillation equipment, after all. Farewell, alembic! I recently read the wonderful biography Isaac Newton by talented science writer James Gleick. This book was a Pulitzer finalist in 2004. The Guardian called it “a masterpiece of brevity and concentration,” and I would indeed have liked it to have been slightly longer, because the story it tells is fascinating. Newton overcame a troubled childhood and made enormous contributions to the physics of motion and light, as well as to the calculus. However, he was also interested in theology and alchemy, and ran the Royal Mint. A complex man – and Gleick tells his story well. Newton’s legacy transformed physics. For example, inspired by Newton’s formulation of gravity, Edmond Halley predicted the return of the comet that bears his name, as well as the eclipse of 1715. The descendants of Newton’s reflecting telescope helped develop modern astronomy. I can certainly recommend this short, but interesting, biography. A few days ago, the Royal Observatory Greenwich announced the winners of its Astronomy Photographer of the Year competition. Click the link to look at these fantastic pictures, or see the coverage in Wired. The Register is running a great story about Bletchley Park, the architecturally confused site which housed the British code-breaking effort that helped win World War II. Bletchley was home to Colossus, the world’s first programmable electronic digital computer, and to the machines that broke the Enigma cipher. Proudly restored, much of this equipment is again operating at Bletchley, which is now a museum. I certainly recommend a visit to this fascinating historic site (a guide, either human or electronic, is probably essential). For those who can’t make it, the next best thing would be to watch the movie Enigma, or of course to read some of the many books that tell parts of this once-secret story.